Saturday morning brought my two junior clients up to the five hour point of their course on Basic Muay Thai for Martial Arts Cross Training. We worked on combining stand-up striking and clinch into combinations. I brought in the round knees at the clinch range and also taught tactics for breaking the clinch and following up. The lesson started with the usual set of dynamic stretching and callisthenic exercises. We then did some mirror footwork and technique placement exercises, using the teep to gauge ranges and set up combinations. We also looked at closing in tactics. Training then carried over onto the focus mitts, where we looked at developing more power. 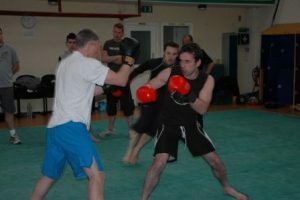 We used various stand-up set-ups – teep as an unbalancing setup for a low round kick, long-guard jab/spear knee, shin-check/cross, cross-body check/jab/cross and 1-4 punch combinations with rear leg round kicks and switch kicks. Then we looked at kick-catches into diagonal knee strikes and low round kicks. Clinch included spear, diagonal and round knee strikes as well as the basic sweep. I also taught the importance of effective breaks into kicks. The lesson finished with 4 x 3 minute rounds on the pads.